1834 — William Sublette built Fort William at the confluence of the Laramie and North Platte Rivers to buy buffalo robes from the Sioux and Cheyenne. 1836 — The American Fur Company, which since 1828 had operated Fort Union 400 miles north at the junction of the Yellowstone and Missouri Rivers, bought out the operators of Fort William. 1841 — American Fur built a new adobe stockade that they called Fort John. 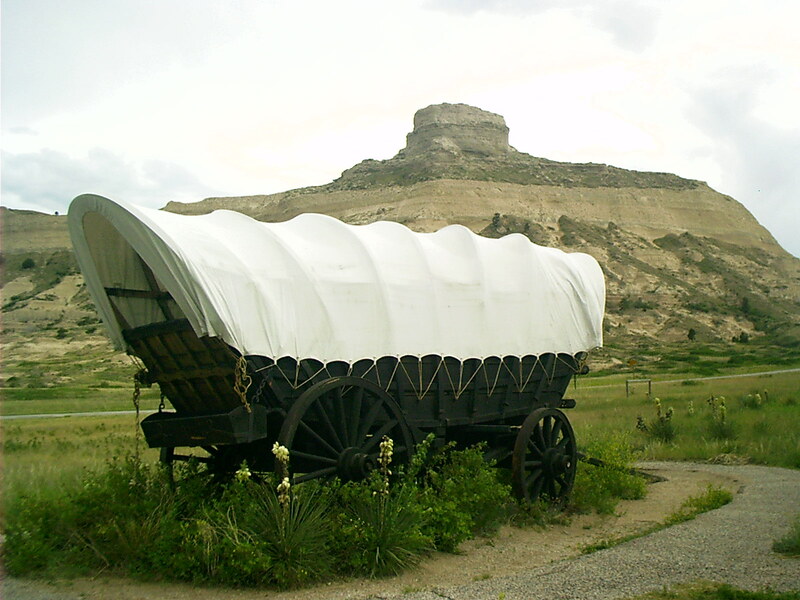 It was a stopover point along the Oregon Trail during the 1840s and the Mormon Trail beginning in 1847. 1848 — Gold was discovered in California. 1849 — The U.S. Army bought the operation at Fort John, which had all along been commonly referred to as Fort Laramie. The timing was fortuitous for encouraging trade and commerce. New buildings were quickly erected outside the old stockade. This, the bachelor officers' quarters, was one of the first. The space between interior and exterior walls was filled with brick, which increased the building's thermal mass and evened out indoor temperature swings. Because the Platte was in no sense navigable, supplies were trucked overland to Fort Laramie from St. Louis, MO. 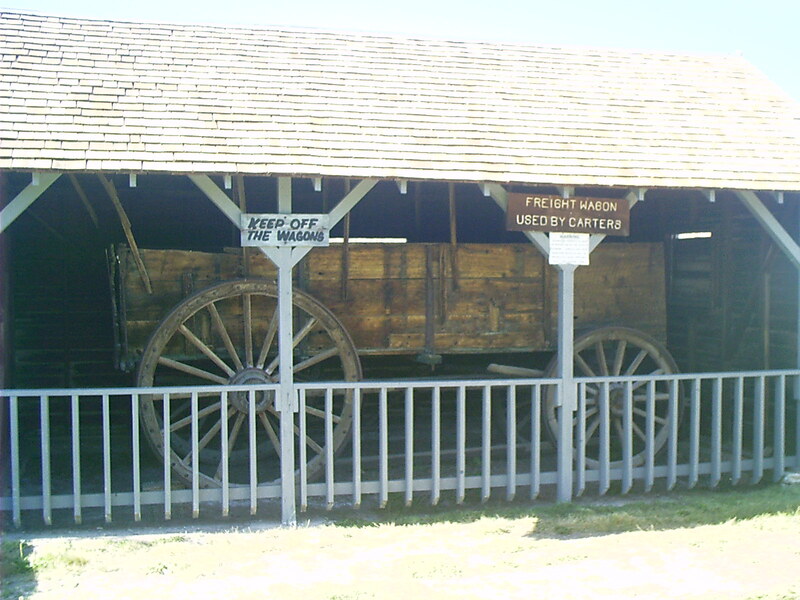 Here is a replica of a type of wagon used by government contractors based on the famous design from the mountains of Pennsylvania. These wagons were quite a bit larger than the typical covered wagon used by emigrants. They were drawn by mule teams instead of oxen. The floorboards were concave to keep heavy freight centered. 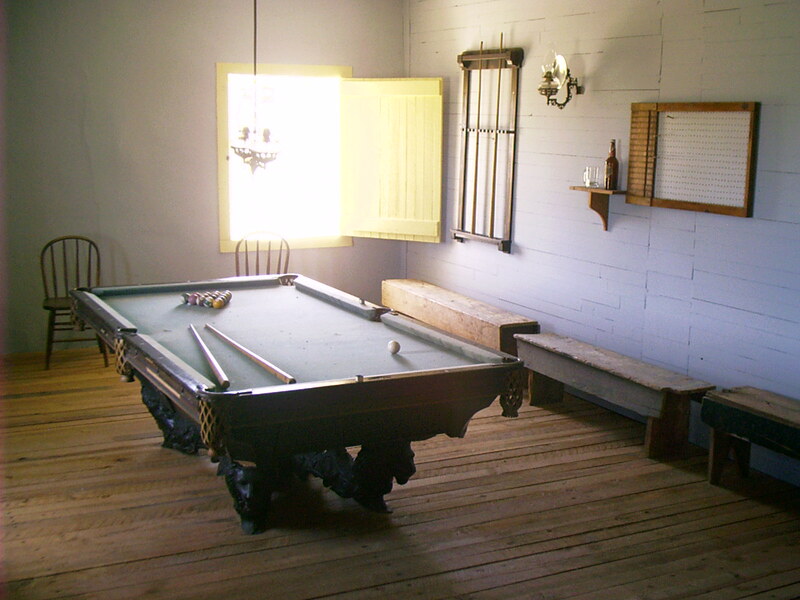 Seams in the floor, sideboards, and endgates were caulked to turn water during river crossings so cargo would stay dry, hence the term prairie schooner. Here is a specimen more like the one portrayed in the movie Dances with Wolves (1990), aka Kevin's Gate. 1843 — Jim Bridger and Louis Vasquez (both natives of Missouri) established Fort Bridger in an oasis on Blacks Fork of the Green River in Spanish New Mexico. 1847 — Brigham Young began the Mormon emigration to the Great Salt Lake. 1848 — The Treaty of Guadalupe Hidalgo ended the Mexican War and conveyed Spanish New Mexico to the United States — territory which included what are now the states of California, Nevada and Utah, most of Arizona, and bits and pieces of Wyoming, Colorado and New Mexico. 1855 — A deed transferring Fort Bridger to the LDS Church was witnessed by Bill Hickman reputedly an operative for the Utah territorial administration. (He was excommunicated in 1868.) Neither Bridger nor Vasquez was present. 1857 — LDS militia (under Hickman according to his allegedly autobiographical account) evacuated the post and burned the stockade and buildings to deny use of the facility to the advancing U.S. Army (guided by Jim Bridger) during a dispute over territorial government called the Utah War. As part of reparations after the war, the LDS Church paid what they thought was the second and final installment on the property to the Army. The Army subsequently refused to acknowledge any claims to the property from either the LDS or Bridger. 1858 — An improved road called the Lander Cutoff bypassed Fort Bridger on the Oregon and California Trails. 1881 — Jim Bridger died in Missouri. 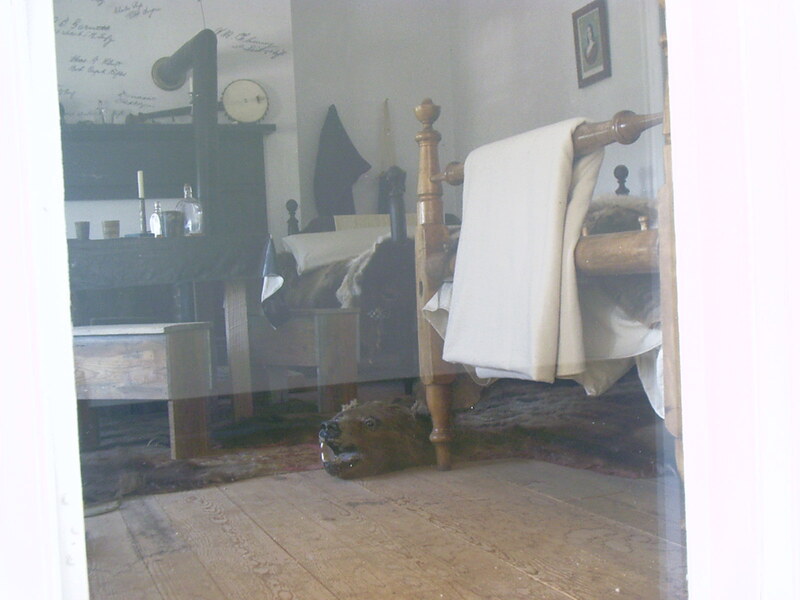 1890 — The Army closed Fort Bridger and Fort Laramie and auctioned furnishings and buildings. 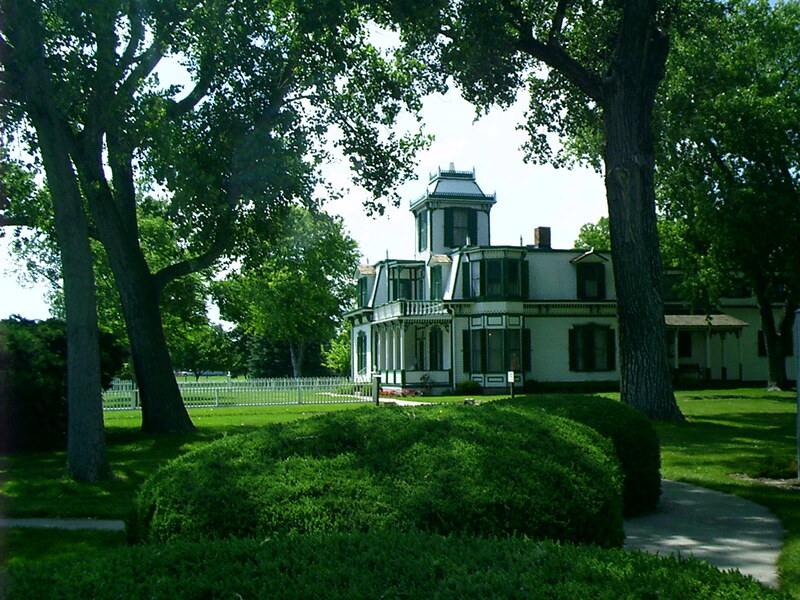 1899 — Congress appropriated $6 thousand to settle the Bridger estate's claim to the fort property. 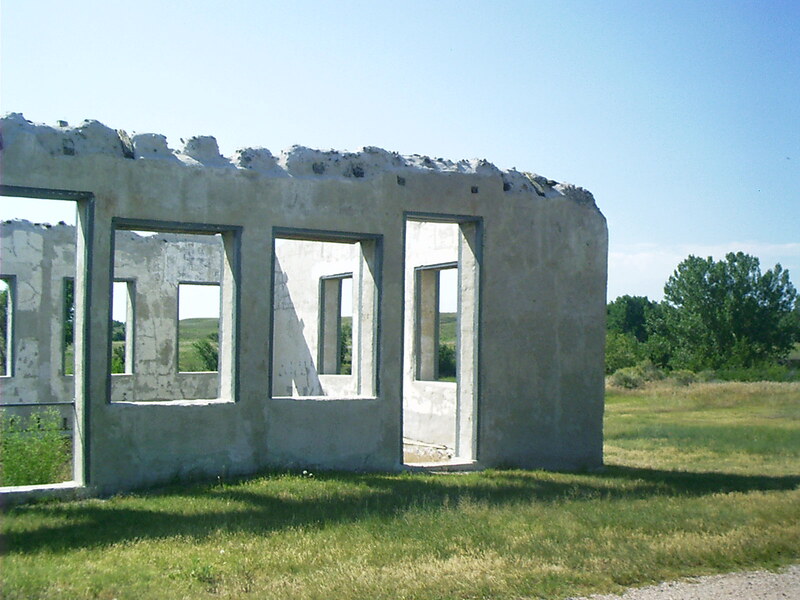 1928 — Wyoming acquired the grounds for a State Park and began restoration of the remaining structures. 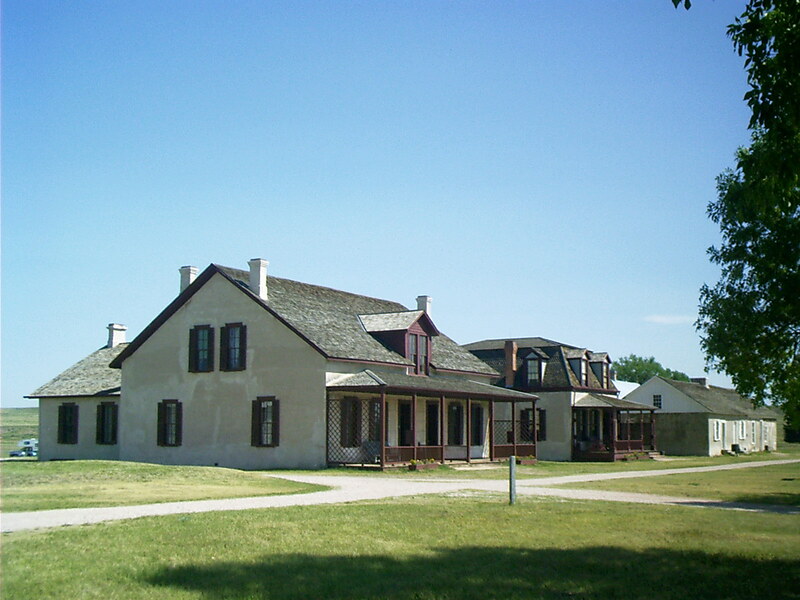 Left to right: Post Surgeon's Quarters (1875), Lt. 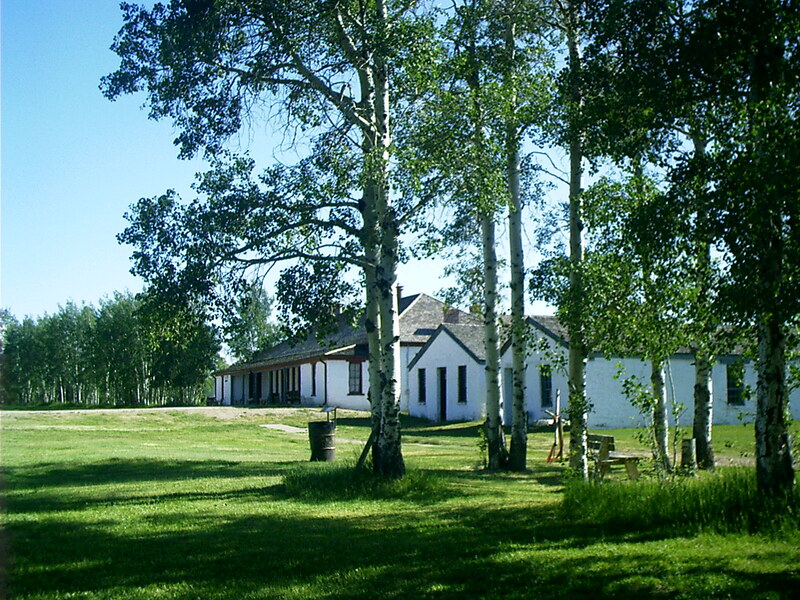 Colonel's Quarters (1884), and Post Trader's Store (1849). "The Fort Laramie Treaty of 1851 was signed on September 17 between United States treaty commissioners and representatives of the Sioux, Cheyenne, Arapaho, Crow, Shoshone, Assiniboine, Mandan, Hidatsa, and Arikara nations. The U.S. government promised control of the Great Plains which was the bulk of Native American territory, for 'as long as the river flows and the eagle flies.' The Indians guaranteed safe passage for settlers on the Oregon Trail in return for promises of an annuity in the amount of fifty thousand dollars annually for fifty years. The Native American nations also allowed roads and forts to be built in its territories. The United States Congress later unilaterally cut appropriations for the treaty to ten years' annuities, and several tribes never received the commodities promised as payments. The treaty produced a brief period of peace." • "Treaty of Fort Laramie (1851)." Wikipedia. 4 July 2007. 10 Sept. 2007 <http://en.wikipedia.org/wiki/Treaty_of_Fort_Laramie_%281851%29>. "How many Shoshone are coming?" Ketchum added some figures and reported, "That makes over seven thousand for sure, as of this moment, and we haven't heard from the Crow, the Assiniboine or the Hidatsa." "You mean ten thousand Indians are coming to this fort?" Mercy asked. "At least. More like eleven thousand … twelve thousand." "And we have a hundred and sixty effectives?" "Plus the commissioners … the mountain men … and the dragoons!" "Tell me," said the commissioner, who had followed Mercy across the grounds, "how did this miscalculation occur?" "You tell him, Zendt," Ketchum directed, and Levi asked an Oglala chief to join them. The chief said in broken English, "White man always say 'Chief, do this' or 'Chief, make your tribe do that.' Same like Great White Father. But Indian chief nobody. He my uncle, my cousin. Nobody tell him, 'Chief, you big man now. You run tribe.' He run tribe just so long he do what we want. My uncle, he chief and he have some good ideas, some bad. He talk, we listen, we do. He good man, but he nobody." "Don't you choose a chief?" the commission[er] asked. "Well, for life?" The young Oglala laughed. "Chief he lose teeth, he can't bite buffalo, he finish." "What does this have to do with ten thousand Indians?" the commissioner asked. Zendt replied, "Just this. You can't go to the Oglala and tell them, 'Send us your chiefs,' because if the chiefs are going to talk about something that affects the whole tribe, the whole tribe will come along. A chief is not a senator. Like the brave says, he's only as good as his teeth. Or as long as he gives sound advice." • Michener, James A. Centennial. NewYork: Fawcett Crest-CBS, 1978. 443-44. Eleven structures have been restored out of some two dozen that are known to have existed at one time or another. Sadly the Fort John adobe stockade is long gone except for a slight rise in the general level of the soil where its walls collapsed back into the terrain. This is the Cavalry Barracks (1874). Many of the structures on the site were built of concrete. This is the earliest such building surviving. 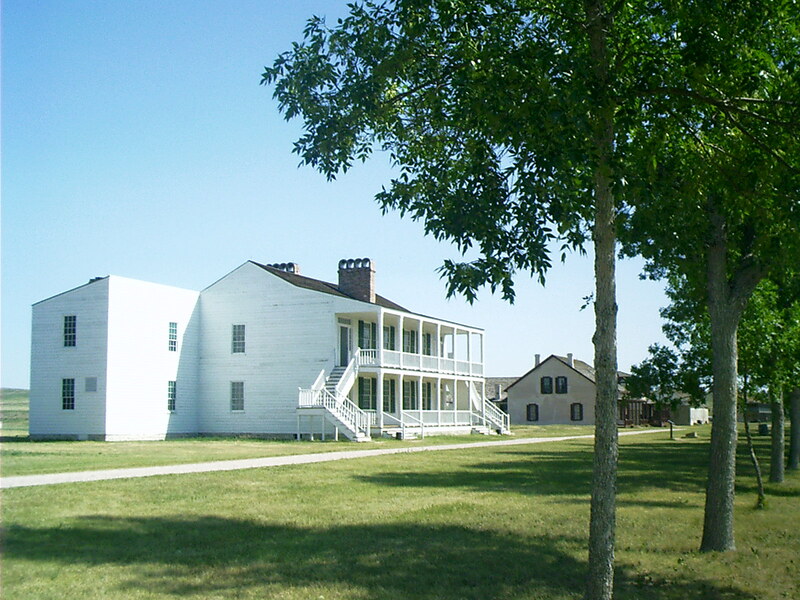 Fort Laramie was the only outpost of eastern society along the Oregon Trail. Curiously, it was a focal point of wilderness society, too, and held an Indian burial ground. • Jackson, William Henry. "Fort Laramie." 1868. Trails of Hope: Overland Diaries and Letters, 1846-1869. 2002. Special Collections, Harold B. Lee Library, Brigham Young University, Provo, UT 84602. Photographic print, b&w, 13 x 9 cm. 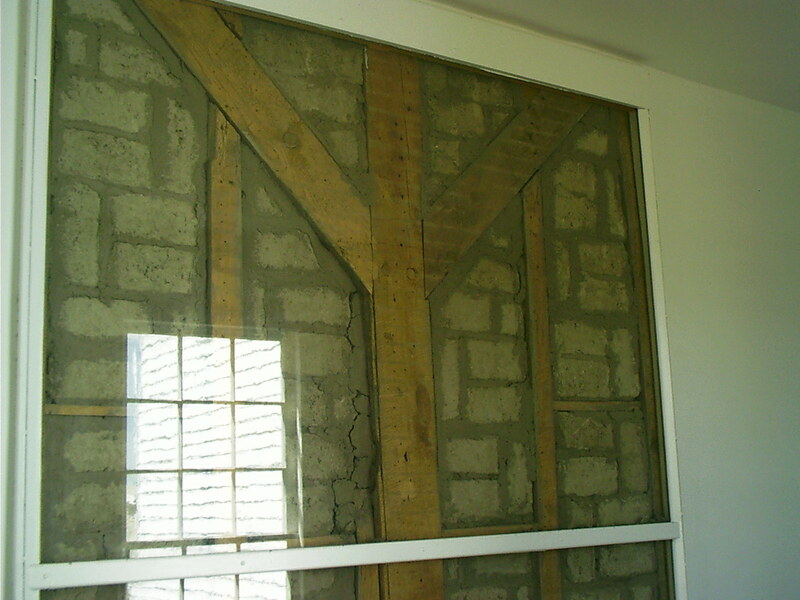 18 Sept. 2007 <http://contentdm.lib.byu.edu/ cdm4/item_viewer.php?CISOROOT=/ OTImages&CISOPTR=10& DMSCALE=100&DMWIDTH=2400& DMHEIGHT=2400&DMX=0&DMY=0& DMMODE=viewer& DMTEXT=%20Henry&REC=4& DMROTATE=0>. 1863 — Gold was discovered at Virginia City in the Idaho Territory. 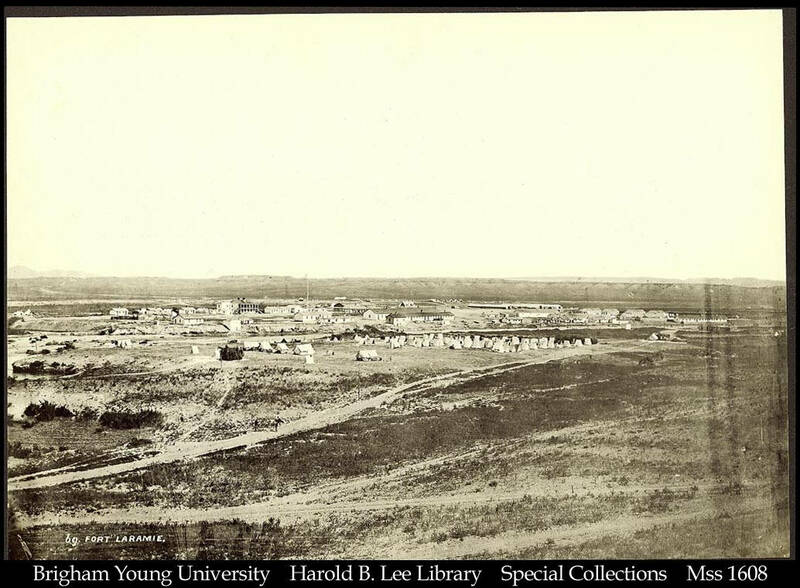 After the Civil War, traffic increased up the Bozeman Trail into Montana, and the U.S. Army billeted troops along it, provoking Red Cloud's War, in which the Army was worn down. In the Fort Laramie Treaty of 1868, the Lakota (Sioux) forced the Army to abandon the forts in the Powder River grasslands of Wyoming. No white settlement or travel was to be permitted there. A Sioux reservation was created covering what is now that portion of South Dakota west of the Missouri River. "ARTICLE 2. The United States agrees that the following district of country, to wit, viz: commencing on the east bank of the Missouri River where the forty-sixth parallel of north latitude crosses the same, thence along low-water mark down said east bank to a point opposite where the northern line of the State of Nebraska strikes the river, thence west across said river, and along the northern line of Nebraska to the one hundred and fourth degree of longitude west from Greenwich, thence north on said meridian to a point where the forty-sixth parallel of north latitude intercepts the same, thence due east along said parallel to the place of beginning; and in addition thereto, all existing reservations on the east bank of said river shall be, and the same is, set apart for the absolute and undisturbed use and occupation of the Indians herein named, and for such other friendly tribes or individual Indians as from time to time they may be willing, with the consent of the United States, to admit amongst them; and the United States now solemnly agrees that no persons except those herein designated and authorized so to do, and except such officers, agents, and employes of the Government as may be authorized to enter upon Indian reservations in discharge of duties enjoined by law, shall ever be permitted to pass over, settle upon, or reside in the territory described in this article, or in such territory as may be added to this reservation for the use of said Indians, and henceforth they will and do hereby relinquish all claims or right in and to any portion of the United States or Territories, except such as is embraced within the limits aforesaid, and except as hereinafter provided." • Fort Laramie Treaty. 1868. 10 Sept. 2007 <http://puffin.creighton.edu/lakota/1868_la.html>. 1874 — Gold was discovered in the Black Hills on the Sioux reservation. 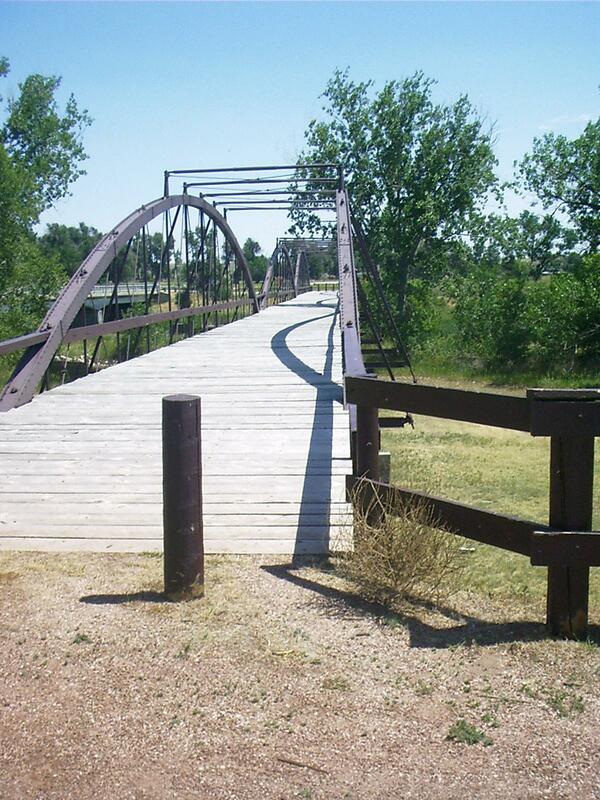 1876 — The North Platte River bridge opened at Fort Laramie. 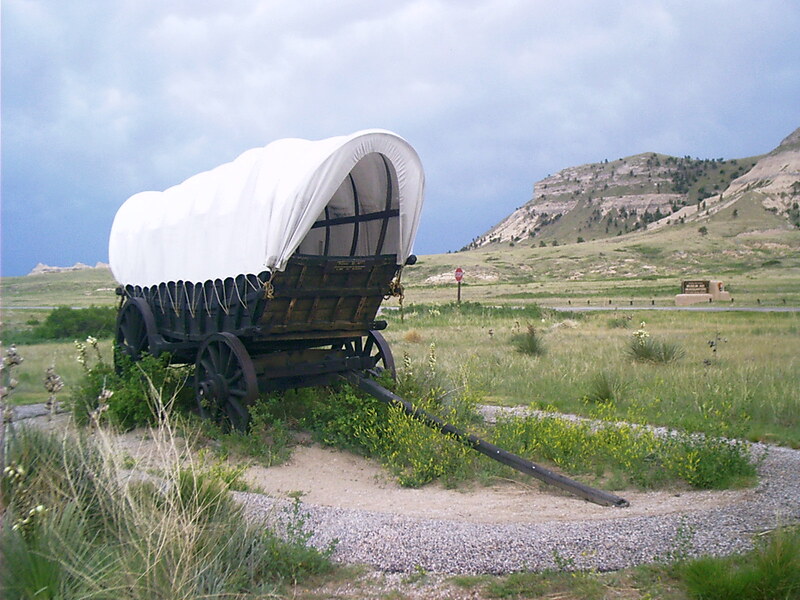 It carried the stagecoach line from the railhead at Cheyenne in the Wyoming Territory to Deadwood and Lead (pronounced LEED, a gold lode) in the Black Hills on the Sioux reservation. 1876 — The Sioux wiped out the U.S. Army 7th Cavalry under Custer at the Battle of the Greasy Grass. 1877 — Congress abrogated the 1868 Treaty by approving an agreement with a minority of the Sioux to add 900 thousand acres to the Sioux reservation but take away 7 million acres including the Black Hills. Also the Native Americans were to surrender hunting rights outside the reservation in return for subsistence rations. William Frederick "Buffalo Bill" Cody (at age 12, so he claimed and so it is believed) was a guide for the Army during the Utah War. In 1883 he became impresario of "Buffalo Bill's Wild West," a traveling circus. He operated a dude ranch near the town of Cody, WY, his namesake, and catered big-game hunts from there. This home in North Platte was winter quarters for the circus. "As the Wild West toured North America over the next twenty years, it became a moving extravaganza, including as many as 1200 performers. 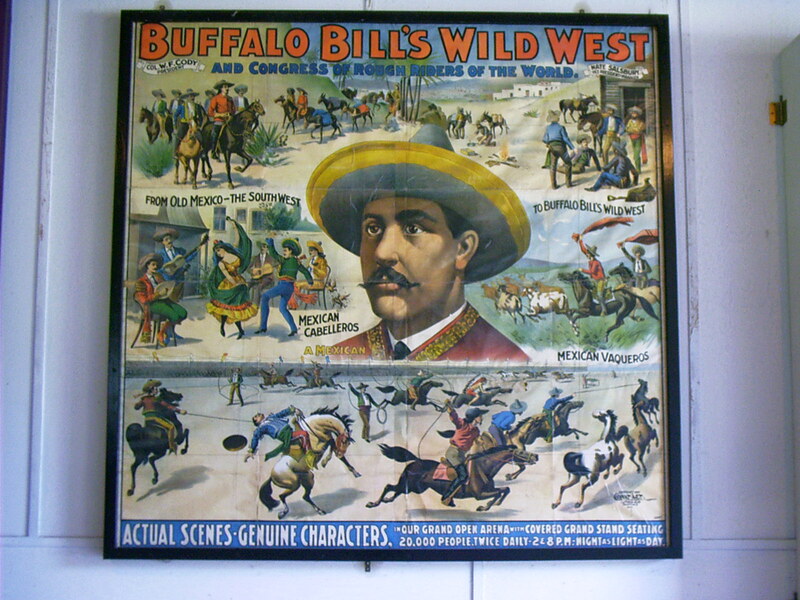 In 1893 the title was changed to 'Buffalo Bill's Wild West and Congress of Rough Riders of the World.' The show began with a parade on horseback, with participants from horse-culture groups that included US and other military, American Indians, and performers from all over the world in their best attire. There were Turks, Gauchos, Arabs, Mongols and Cossacks, among others, each showing their own distinctive horses and colorful costumes. Visitors to this spectacle could see main events, feats of skill, staged races, and sideshows. Many authentic western personalities were part of the show. For example Sitting Bull and a band of twenty braves appeared. Cody's headline performers were well known in their own right. People like Annie Oakley and her husband Frank Butler put on shooting exhibitions along with the likes of Gabriel Dumont. Buffalo Bill and his performers would re-enact the riding of the Pony Express, Indian attacks on wagon trains, and stagecoach robberies. The show typically ended with a melodramatic re-enactment of Custer's Last Stand in which Cody himself portrayed General Custer." • "Buffalo Bill." Wikipedia. 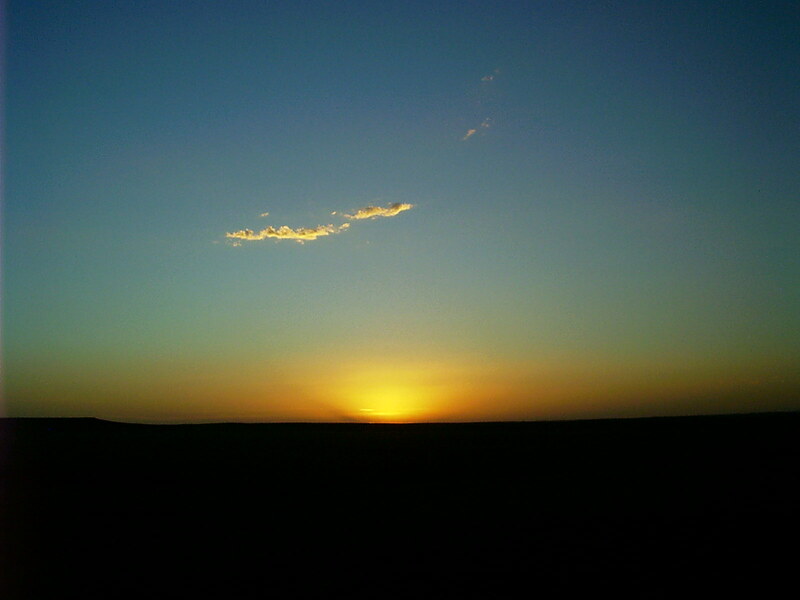 13 Sept. 2007. 13 Sept. 2007 <http://en.wikipedia.org/wiki/Buffalo_Bill_Cody>. The Wild West show outgrew it's North American roots and toured in Europe. It was the pinnacle of showbiz before the advent of motion pictures. Based in extravagant notions of events foisted on the imagination of a nation by the yellow press, it promulgated a romantic view of the history of the American West not only domestically but also worldwide that has become accepted. 1889 — South Dakota was admitted to the Union. 1890 — Wyoming was admitted to the Union. 1890 — The Wounded Knee Massacre brought an end to the Indian Wars on the Great Plains. 1893 — Historian Frederick Jackson Turner noted 1890 as the end of the decade that marked the closing of the American Frontier. In 1980, the Supreme Court upheld a 1979 ruling of a special Court of Claims awarding the Sioux $17.5 million, the fair market value of the Black Hills in 1877, plus $89.3 million, simple interest for 102 years at 5% per year, because the 1877 act of Congress amounted to an uncompensated taking. The issue had been in litigation since 1923. • United States v. Sioux Nation. 1980. 13 Sept. 2007 <http://www.utulsa.edu/law/classes/rice/USSCT_Cases/US_v_Sioux_Nation_448_371.htm>. The Sioux have never yet accepted this settlement, however, and desire the return of such portions of western South Dakota as now remain in Federal hands. They argue that even the shrine to America's Founding Fathers cut into Mount Rushmore renders the Black Hills no more sacrosanct to secular humanists than Harney Peak is sacred to them. The continuing dispute clouds further development of mineral resources in the area. 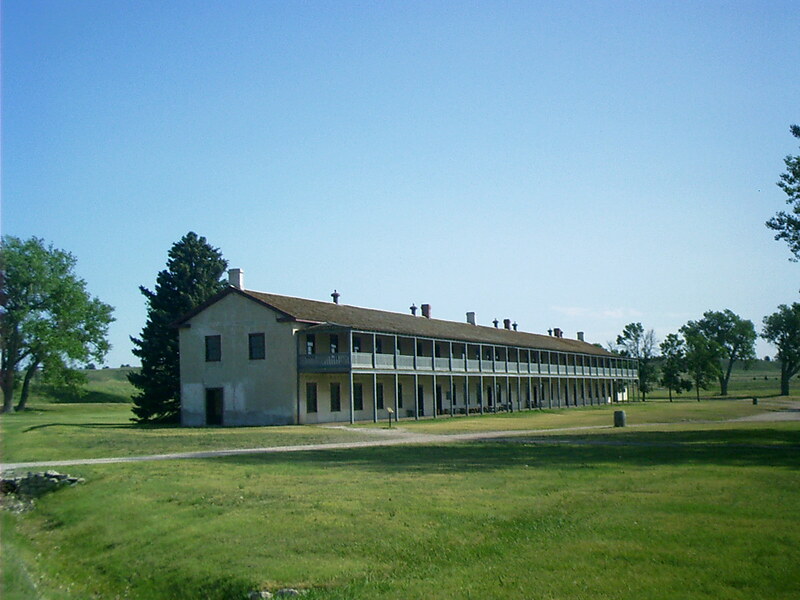 1937 — Wyoming purchased the historic grounds of Fort Laramie and donated the site to the National Park Service, which began restoration of the remaining structures. 2002 — The Homestake Mine in Lead, SD, closed after extracting since its inception in 1876 some 40 million ounces of gold, which would have a value of over $40 billion at current prices. Rhode, Chuck. "Defense." The Flat Route. 21 Jul. 2007. Lacus Veris. 24 Apr. 2019 <http://lacusveris.com/Moab/Snaps/Defense.shtml>. Last modified 4 Oct. 2015. Served 9386 times between 16 May. 2010 and 24 Apr. 2019. Contact mailto:CRhode@LacusVeris.com?subject=The+Flat+Route.